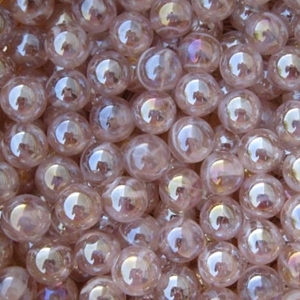 MoonMarble.com - Medusa Jellyfish 5/8"
Bulk Marbles → Transparent Marbles, all sizes → Fancy Transparent Swirl Styles, all sizes → Medusa Jellyfish 5/8"
Medusa Jellyfish have a transparent pink base with white swirls inside and on the surface. The surface is iridized which gives the marble an oily, reflective sheen. These marbles are sold in one pound bags. There are about 80 to 90 marbles in a pound. Sizes may vary slightly. Warning! : Choking Hazard. This toy is a marble. Not recommended for children under 5 years.